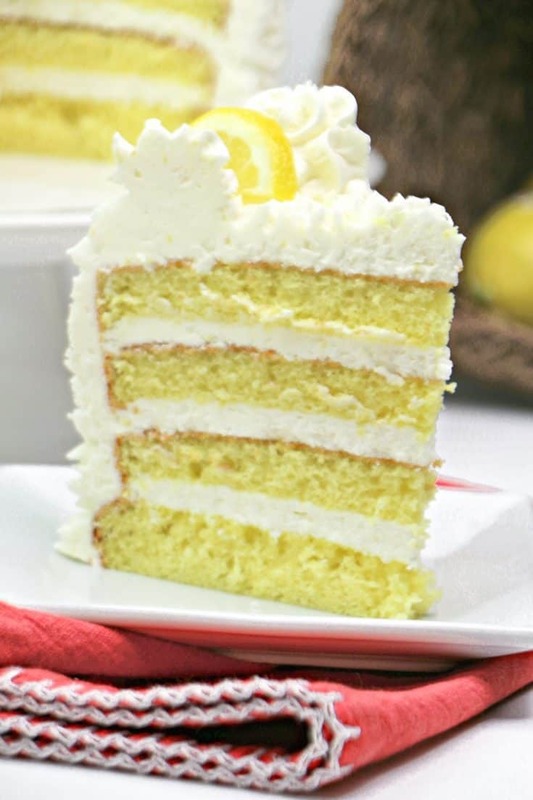 Lemon lovers rejoice! 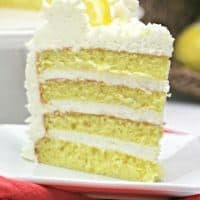 This 4-tier lemon layer cake is topped with a delicious lemon frosting for the perfect combination of sweet and tangy. After this incredible lemon bundt cake I have been getting requests for more lemon flavored desserts. And you know that I don't like to disappoint. 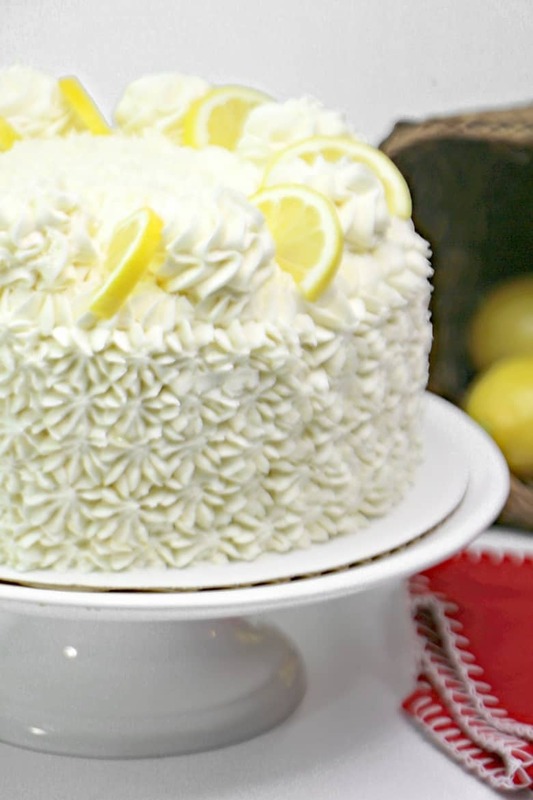 So, I am happy to report that today I have another amazing lemon recipe for you. Don't let the layers in this 4-tired beauty intimidate you. It really isn't all that difficult to make a tiered cake. It just takes a bit more time — and more cake pans — than making a traditional cake. Just take your time assembling and frosting the cake and you will be golden. Having the right tools is helpful as well. Make sure that you should have a flat cake stand or flat serving platter to assemble your cake. You don't want to be trying to build a layer cake on an angled surface. 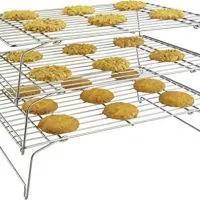 A cake leveler is helping in ensuring each layer of cake is flat as well. You could use a serrated knife instead, but I have found it to be easier to level a cake with the special tool. 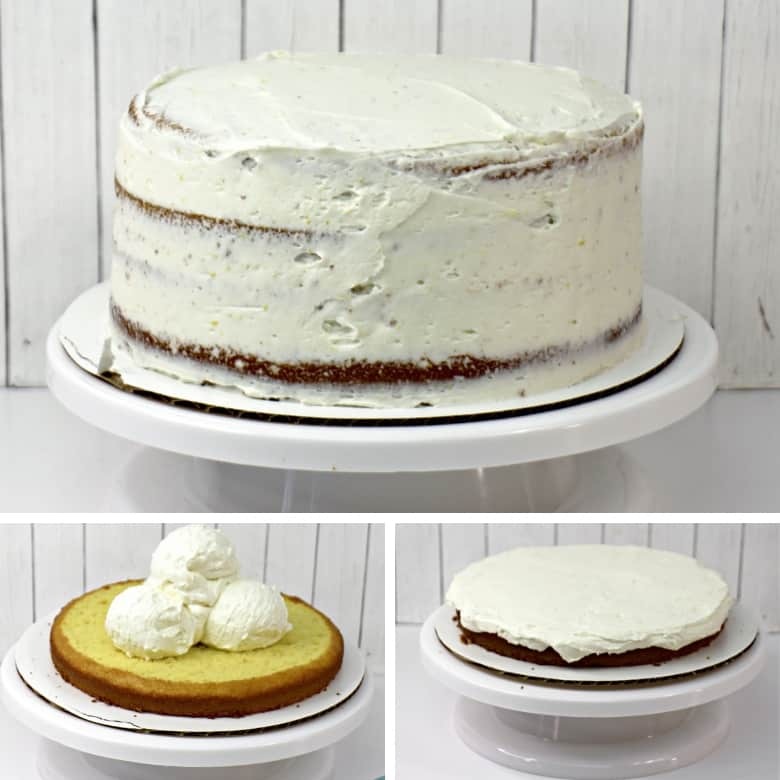 An offset spatula will make frosting the cake as easy as possible. Another key to making tier cakes is to make sure that you have plenty of frosting. Spreading thick layers is much easier than spreading thin layers and struggling to cover the whole cake. 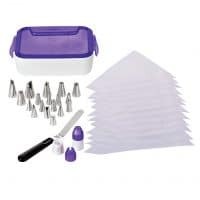 If you would like to decorate your cake like we did, a cake decorating set with piping bags and tips in necessary as well. A turntable cake decorating stand is rather helpful for decorating, but not entirely necessary. Or, if you wanted to opt for a simpler look, you could just ice your cake with the offset spatula and leave it at that. 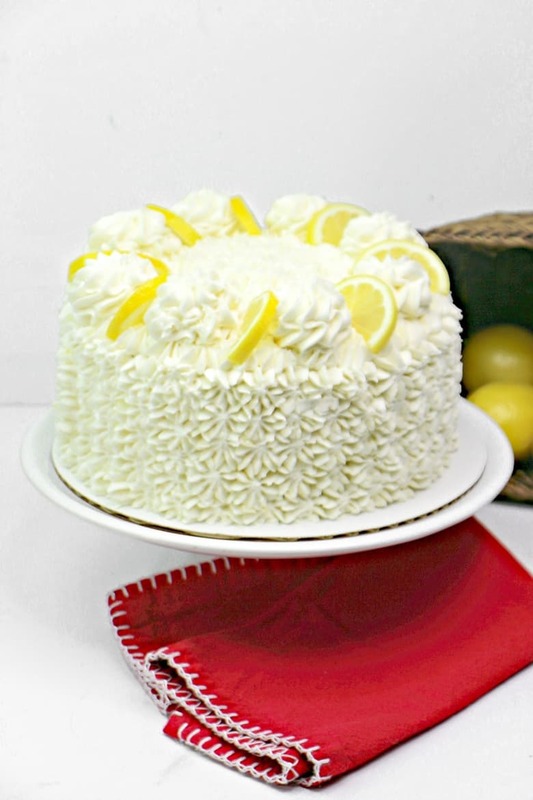 Sweet and tangy 4-tier lemon layer cake with a delicious lemon frosting. 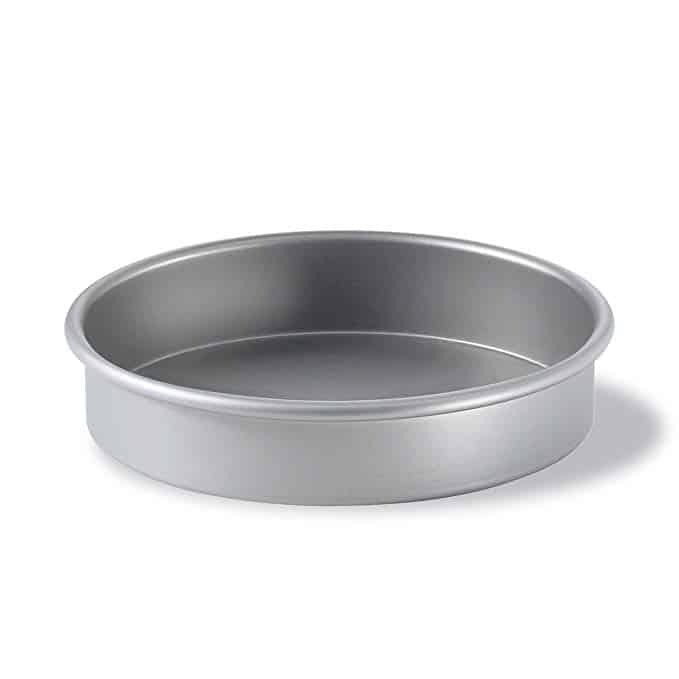 Preheat oven to 350 and prepare four 9 inch round cake pans with non-stick spray. Make the cake: In a large bowl, whisk the flour, baking powder, and salt together. Set aside. Using a stand mixer, beat the butter and sugar together until creamy. Beat in the eggs and vanilla extract until combined. With the mixer on low speed, add the dry ingredients, mixing until just until combined. With the mixer still running on low, add the buttermilk, lemon zest, and lemon juice and mix just until combined. Pour batter evenly into cake pans. Bake for 20-25 minutes, or until toothpick inserted in center comes out clean. Remove pans from oven and place on cooling rack to allow to cool fully before frosting. Make the frosting: Using a standing mixer, cream together all the frosting ingredients until stiff and smooth peaks form. Assemble & frost: Using a serrated knife or cake slicer, slice a thin layer off the tops of the cakes to create a flat surface. Place 1 cake layer on your serving plate. Evenly cover the top with about 1 cup of frosting. Repeat with 2nd and 3rd layer. Add 4th cake layer and spread frosting to cover top and sides of the cake. Decorate: Scoop remaining frosting into a piping bag fitted with a star tip and cover the cake with dollops of frosting. Pipe larger dollops of frosting onto the top rim of the cake. Add sliced lemons in between the larger dollops.